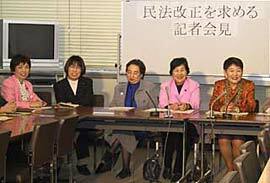 Female lawmakers hold a press conference to appeal for implementation of a system allowing the option for separate surnames for married couples. 2001. Photo Courtesy of Yoshikawa Haruko. Japanese law requires a married couple to have the same surname. Traditionally, in most cases it was the woman who changed her surname at marriage. However, as the number of working women increases, there are more voices seeking acceptance of separate surnames for married couples. A change of surname may inconvenience a working woman by lowering her visibility among clients. Moreover, some women found it intrusive to their privacy because a change of her surname informs business-related people of her private circumstances such as marriage and divorce. Since current law does not permit separate surnames for married couples, many women continue to use their maiden name at the workplace and use their husband’s name only for public documents. In order to respond to changes in society, bills requesting permission for separate surnames for married couples have been submitted to the Diet many times, yet they have never passed. Click CHART to see the results of an opinion poll regarding separate surnames for married couples.